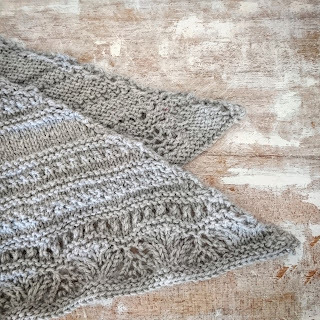 I have just finished knitting up a beautiful shawl called Balm to the Soul. And it really has been. I needed something simple and comforting, and this has been perfect. The pattern was easy enough for my concentration levels (low), and although there are mistakes in it, they have become features. I've been able to complete it in a fairly short space of time too, which is satisfying. The alpaca yarn from Adagio, is beyond description. It is soft, snuggly and light. It has a smoothness to it, that seems like lanolin, but can't be, because Alpaca doesn't have any. I hope someone knows and can tell me what it is. Or perhaps it's just part of the glory of Alpaca! If you've been thinking of trying some of their yarns, I highly recommend you do. I was inspired by the Adagio Alpaca facebook post, about a pattern called Curl Curl designed for their yarn by Meg Gadsbey, who has lovely, modern styles. 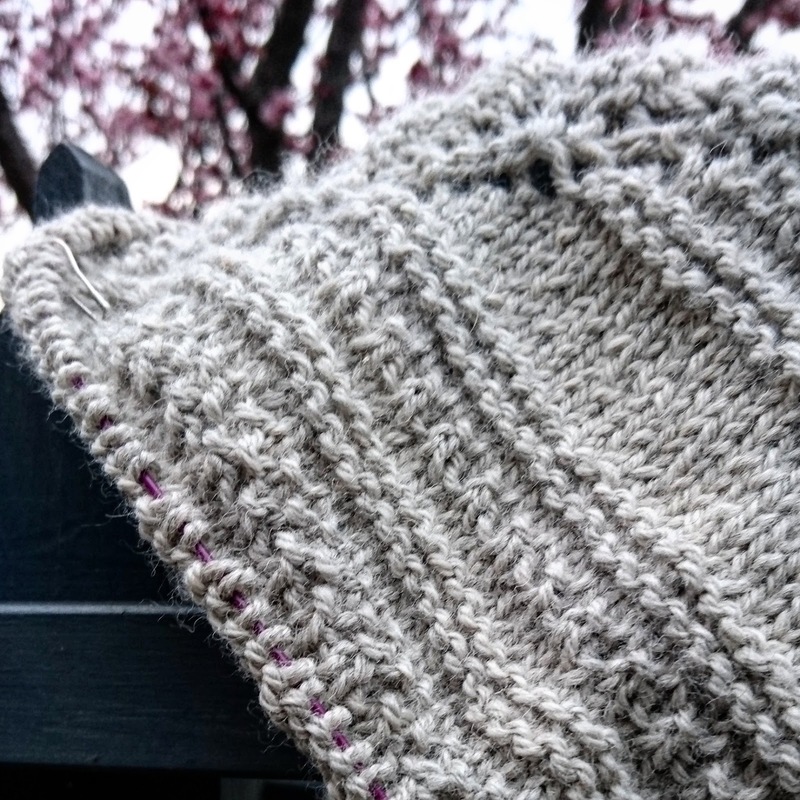 Their kit contains the yarn & pattern for a beautiful simple and warm cowl. You can get it here. I was all set to cast on, but I had more yarn than the pattern required, which I really wanted to make the most of. 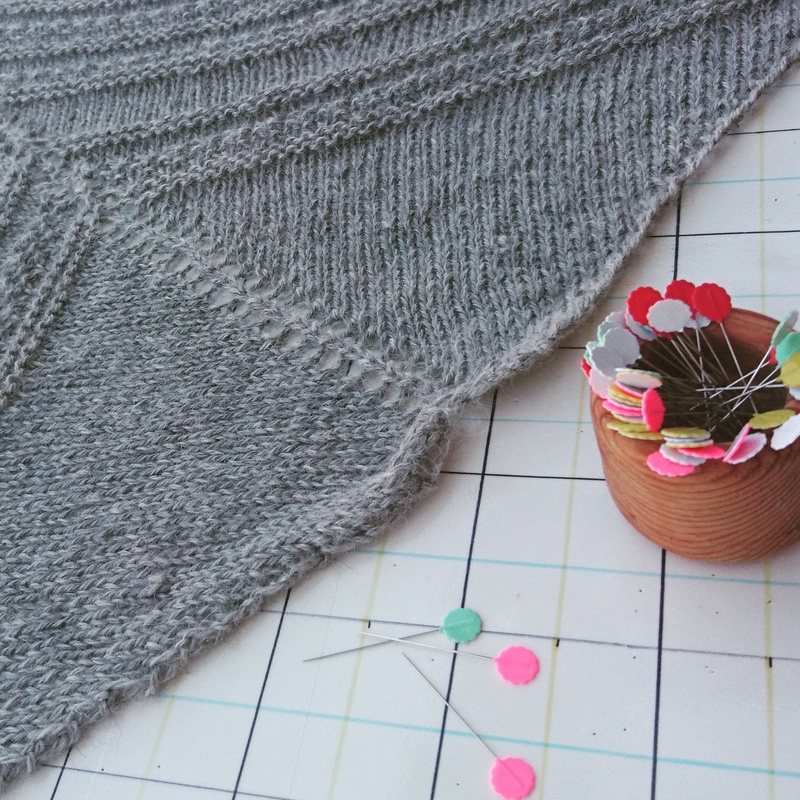 If you are looking for a simple, snuggly cowl to knit, this would be a great project - also good for learning to knit in-the-round. This led to a Ravelry search for something else fabulous. 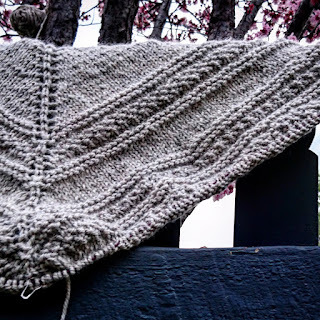 If you aren't aware of Ravelry, and want to get into knitting or crochet, it's just amazing. 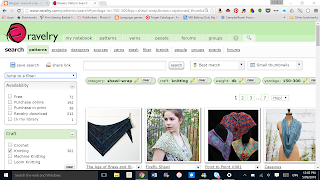 It's an online collection of patterns, yarn databases, forums, groups, you name it. The search functions within Ravelry are awesome. 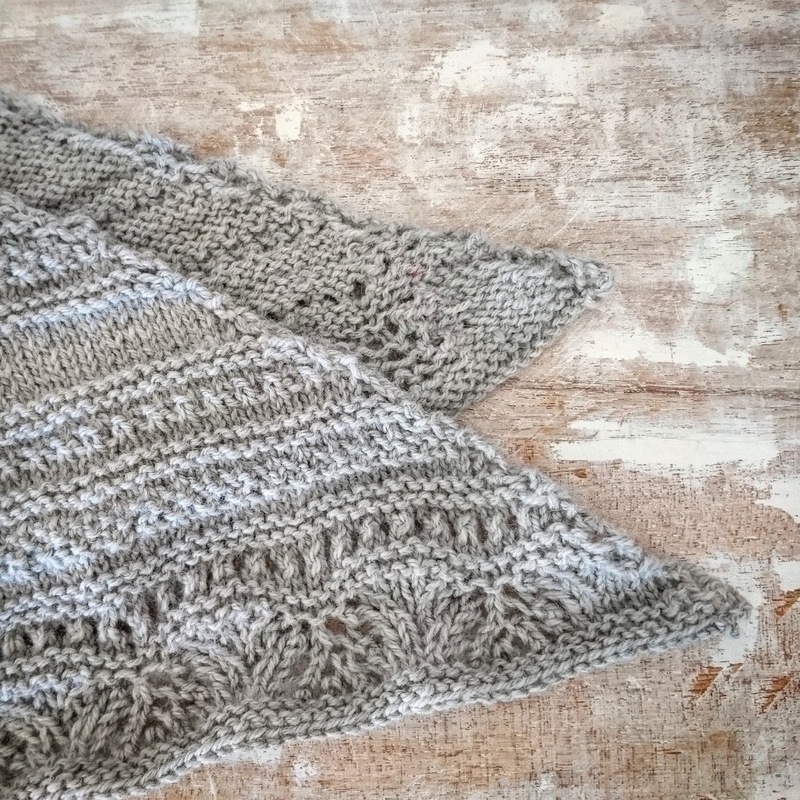 I was able to search for a shawl with the type of yarn (DK / 8 ply), and the yardage. Then I browsed through the options that came up, and the name of this one caught my eye. All the options you can choose from are listed down the side of the page. Here is what it looked like once I had chosen them. Another thing I love about Ravelry, is that they have regular updates to their Home Page to help you learn how to use all the features of Ravelry. I have enjoyed knitting something chunkier and softer than the fine sock yarn I have been working with on other projects. And it was lovely to knit something quick (I'm a slow knitter). The yarn is called "Clouds", and has the loveliest of greys in it - there is the slightest amount of subtle variegation within the strands of the yarn. It's a little bit 'knubbly' with an imperfection here or there - which I think adds to the cosiness of the yarn. It is such a beautiful yarn to knit with. 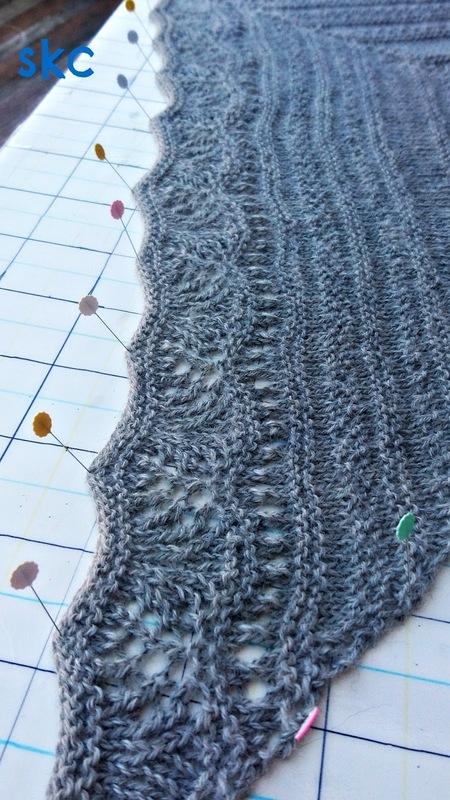 I know there is a larger 4 ply shawl pattern called Contrail coming out later in this yarn, also by Meg Gadsbey - I can't wait to buy it - it's a modern, striking design and it looks fantastic. I'll let you know when the pattern is released! Balm to the Soul is what I have needed in this season, and this knit has been it! It was soothing and comforting. There was time to master the basics of the increasing pattern (on the spine and border) before the other aspects of the pattern began. I'm so pleased with how the lace worked out. Simple, not too fussy, and totally suits the alpaca. If you are thinking of giving this one a go, here are my thoughts and how I changed the pattern. It is a fairly small shawl. Probably a 'shawlette' really. I got worried about this during the knit, wondering how it would be big enough to wear. 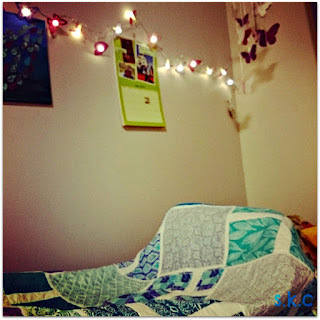 I took a close look at the pattern pictures, and spent time reading through the comments on the Ravelry site - these can be a goldmine for you if you are considering a pattern, and want some perspectives on how other people found it. It is most definitely a triangle shape - which means it isn't long for draping around artistically. It is the perfect size for wrapping snugly around my neck, and tucking the ends in - perfect for a cold weather shawl. * This changed my stitch count, which affected the lace stitch. The lace pattern repeat was in multiples of 12 stitches. I increased the number of repeats, and kept enough "left over" to still incorporate the lace elements that were not part of the repeats. I think I ended up with a wider section of stocking stitch near the spine of the scarf, but I like how it has turned out. * Blocking For The Win. 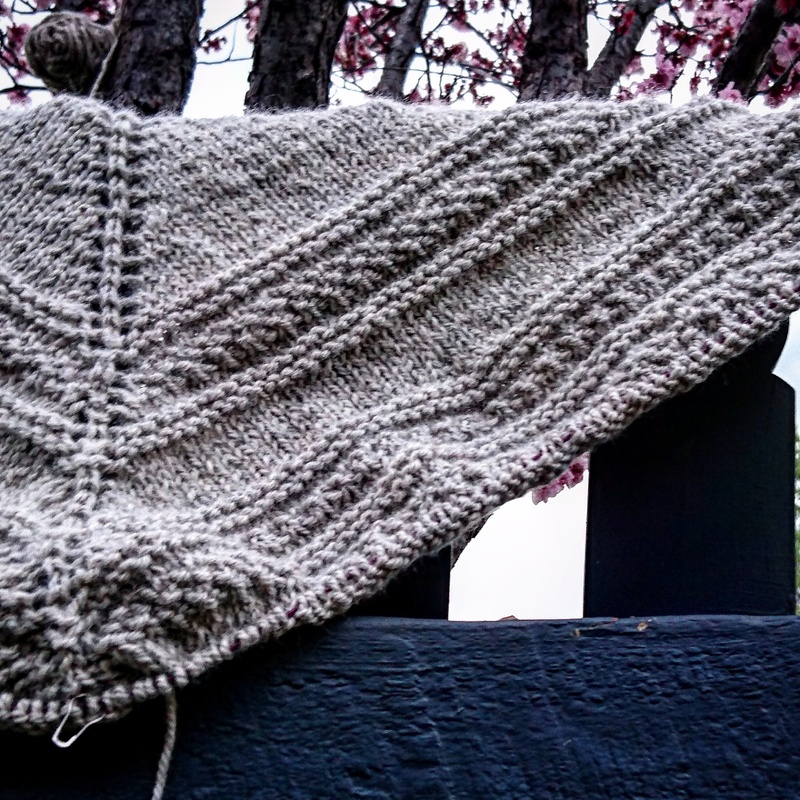 The blocking process was expedited because I *may* have spilled a cup of tea on my new shawl! I love that the lace is called "Crest of the Wave". One of my (and my mum's) favourite places has always been the ocean, so this element is important to me. Although the outer edge of the shawl didn't look very 'wavy', it responded so well to being eased into the wave shape while blocking. I'm thrilled! 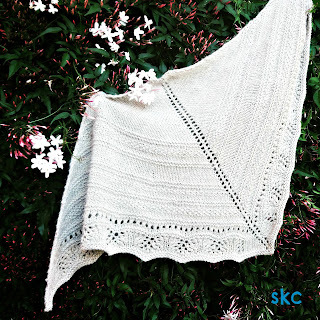 The shawl was designed for teaching Shawl knitting, and I think it would be a great knit to try if you have stuck to scarves so far, and want to expand your knitting repertoire!